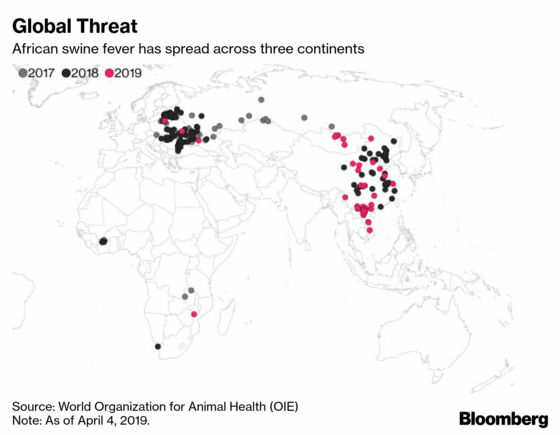 (Bloomberg) -- The relentless proliferation of African swine fever on farms in East Asia is sending shivers through the region’s livestock industry, with more than a million hogs culled since the disease first appeared in August, and that’s just according to official tallies. Supply and demand for hogs is basically balanced short term, but supply is going to tighten and that’s set to continue for a long time, according to the Animal Husbandry & Veterinary Bureau of China’s Shandong province. Farmers are selling pigs at a faster pace and not replenishing stocks, it said. The country has more than 400 million pigs, and pork is the principal source of dietary protein. 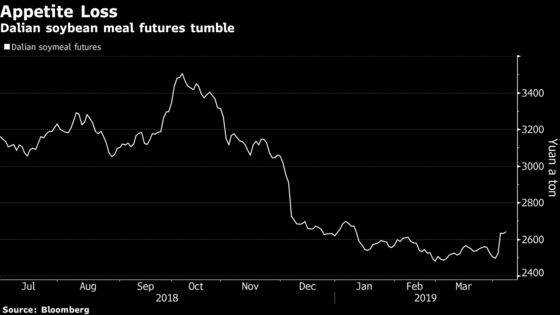 China’s soymeal demand may drop more than 5 percent to 66 million metric tons in 2018-19, the first contraction after 11 years of growth, according to the China National Grain and Oils Information Center. Still, consumption in other segments may curb the decline. Use in poultry, fisheries and donkey breeding has increased, particularly in the northern province of Hebei, said Li Xinxin, a soymeal trader at a Chinese crushing plant. The situation could worsen as the virus spreads to new provinces in countries such as Vietnam. The country has culled more than 73,000 infected pigs since the virus was first found at the start of February, Tien Phong newspaper reported, citing data from the agriculture ministry’s animal health department. The government has announced preventive and control measures to protect a pig population that totals almost 30 million. The livestock feed industry in Vietnam relies almost entirely on imported soymeal, with the country buying 4.8 million tons from overseas last year, according to Nguyen Quoc Dat, vice head of the Vietnam Animal Husbandry Association. If swine fever stays under control, purchases from abroad this year may be little changed, Dat said. Some countries are on a high alert. Thailand stepped up surveillance after Taiwan authorities reported finding pork products from Vietnam tainted with swine fever, according to Sorawit Thaneeto, director general of the Department of Livestock Development. The virus was also detected in Chinese pork products at airports from Japan to Australia, spurring country bans. The most virulent form of the disease can be 100 percent lethal for pigs and wild boars, and there’s no vaccine.